P012: A CASE OF RETRO-ORBITAL HEMATOMA AFTER CARDIAC SURGERY. INTRODUCTION: Ophthalmological complications after cardiac surgery are rare. Late diagnosis can lead to blindness in some cases. 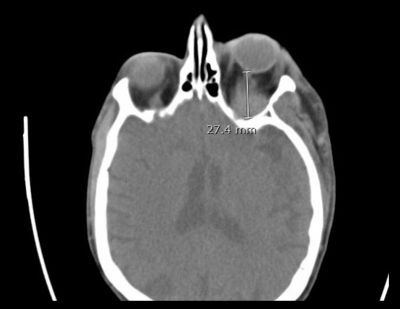 We present a case of retro-orbital hematoma after cardiac surgery. CASE DESCRIPTION: A 78-year-old woman was admitted to the hospital for mitral valve repair due to severe mitral regurgitation. Despite optimal medical management over 3 years, her dyspnea on exertion worsened and became incapacitating. Past medical history included: CAD – NSTEMI s/p stents, stenosis of the proximal left MCA, remote history of head trauma with non-displaced left zygomatic arch fracture, hypothyroidism. The patient underwent a successful elective mitral valve repair without any intraoperative incidents. Heparin was dosed to reach an activated clotting time (ACT) of 480 seconds. Mitral valve annulus was dilated. The valve was repaired using Gore-tex chords. A ring was used for annular stabilization. Anticoagulation was reversed with protamine in a standard fashion. Post-operative course: At around time of extubation in the ICU, patient’s left eyelids were noticed edematous. This progressed to proptosis and impaired left eye vision. On exam, all ductions of left eye were impaired, the eye was globally fixed. Abduction, adduction, supra and infraduction of left eye were limited. Pupils: OS 2mm, nonreactive able to perceive light shadows. OD 3mm, reactive to light. No other neurologic focal signs were noticed. A CT scan showed post-septal mass of left orbit measuring 2.8 x 2.7x 2.3 cm. An emergent surgical evacuation of retro-orbital was performed. Over the following 4-5 days edema of left eyelids, proptosis and visual acuity improved. DISCUSSION: Retro-orbital hematoma (ROH) is a rare complication after cardiac surgery. The incidence of ischemic optic neuropathy (ION) is 0.113% after cardiopulmonary bypass 1. 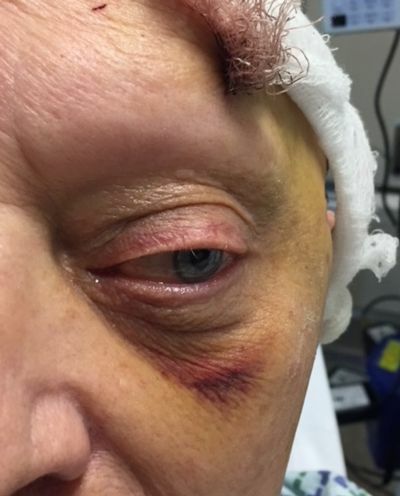 The incidence of orbital hematomas after thrombolytics is less than 1%2. The incidence of retinal emboli post-PCI is calculated at 6.33% as PCI increases the risk of embolization to multiple vessels including ocular vessels3. Risk factors for ROH include blood dyscrasias, anticoagulation, use of thrombolytics and antiplatelet medications. Conditions such as: breast cancer4, anxiety attack, metastatic disease, and Ehlers-Danlos syndrome have been linked to this event. Other factors include hypertension, vascular anomalies such as lymphangioma and AVM and carotid cavernous fistula. ROH has been associated to trauma, labor, prone position, forceful mastication, and Valsalva5. Procedures associated to subperiosteal and retrobulbar hematomas include: blepharoplasty, sinus surgery, ERCP, antiplatelet therapy and general anesthesia. Since the venous circulation in the orbit is valveless, high intracranial pressure may be transmitted to the eyes. Thus, avoiding triggers of sudden increased intracranial pressure such as severe emesis, coughing, straining, or Valsalva-like maneuvers can help prevent these events. Identification of the anatomic location of the hemorrhage is important. Post-septal hemorrhage can be more destructive for the optic nerve compared to pre-septal orbital bleeding. Surgical approach is the preferred method to relieve intraocular pressure, but medical treatments are available with oxygen, IV mannitol, IV acetazolamide, steroids, and B-blockers.